Right inside one of Rome's archaeological sites, an entirely unique visual experience recreating the splendour of an Imperial Forum, using perfectly synchronised projections from 33 Panasonic projectors. Using technology to breathe life back into the monuments of an archaeological site representing 2000 years of history is unquestionably a laudable—albeit delicate and complex—undertaking. This has been done for one of the most emotive Imperial Forums in Rome, the Forum of Augustus, plunging its roots into history and offering a restoration through light, which brings the ruins alive to reveal the greatness of Ancient Rome. A project conceived by two leading scientists, the physicist Paco Lanciano and the well-known television presenter Piero Angela, promoted by the Arts and entertainment department at Rome City Council, and produced by Zètema Progetto Cultura. A complex operation known as "Forum of Augustus 2000 years later" intended for the celebrations of the Bimillennium of the death of Augustus (19 August 14 AD) involving numerous professionals including archaeologists, physicists, computer scientists and experts from the audiovisual world. A sophisticated video projection system, which uses 33 Panasonic projectors, creates careful virtual reconstructions that reveal details and colours from another time, which have been lost over more than two millennia of history. 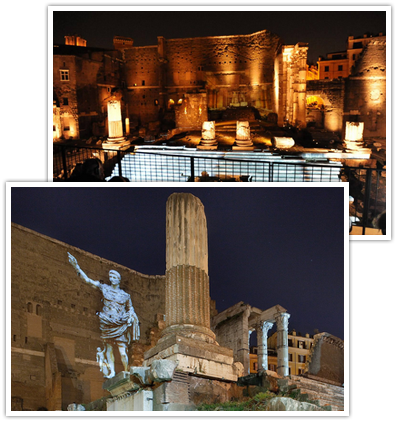 The installation is located in one of the temples of Ancient Rome on Via dei Fori Imperiali, where you can witness the effect of dozens of perfectly synchronised devices. A complex set of video projectors synchronising over a surface 300 meters long. A genuinely breathtaking spectacle played out in front of a kind of enormous amphitheatre. Guiding us through the reconstruction of this projection are three professionals working in the front line of the project: Siro Volpato, Commercial Director at Adeo for Central Italy; Luca Altobelli, founder of HDVI, a computer laboratory providing support and planning services for IT infrastructure and Marco Lucantonio, Executive Manager at AV Set Produzioni. A complex operation known as "Forum of Augustus 2000 years later" intended for the celebrations of the Bimillennium of the death of Augustus (19 August 14 AD) involving numerous professionals including archaeologists, physicists, computer scientists and experts from the audiovisual world. A sophisticated video projection system, which uses 33 Panasonic projectors, creates careful virtual reconstructions that reveal details and colours from another time, which have been lost over more than two millennia of history. The installation is located in one of the temples of Ancient Rome on Via dei Fori Imperiali, where you can witness the effect of dozens of perfectly synchronised devices. A complex set of video projectors synchronising over a surface 300 meters long. A genuinely breathtaking spectacle played out in front of a kind of enormous amphitheatre. Guiding us through the reconstruction of this projection are three professionals working in the front line of the project: Siro Volpato, Commercial Director at Adeo for Central Italy; Luca Altobelli, founder of HDVI, a computer laboratory providing support and planning services for IT infrastructure and Marco Lucantonio, Executive Manager at AV Set Produzioni. "When we were told about the desire to run this project, we immediately understood that it was a major challenge that would enable us to create video representations that would have international appeal," explains Adeo's Siro Volpato. "Society is always open to sophisticated projects such as this one and the idea of finding the best ways of achieving the objectives enthused us from the very outset of the work plan. In this case, we are talking about the use of devices for covering a projection hundreds of meters long. Having already worked with HDVI in the past on various different installations, it was not difficult to draw up a briefing to decide how to proceed. The request was specific and the first step involved choosing the video projectors to be used and preparing a demo, essential for determining if the project was feasible." "Following a careful assessment process by the professionals in the Adeo team, we decided to involve Panasonic in the operation in light of the stringent projection requirements and the number of projectors required to successfully implement the project. Indeed, the video terminal, which is not like a conventional big screen, and a distance of more than 40 meters from the projection point immediately pushed us towards devices that could provide a luminosity of more than 10,000 ANSI lumens. And for the demo in question, we decided to compare the performance of two different types of machine. During the first test, we simultaneously projected the same images using LCD and DLP video projectors in parallel. On completion of the test, a whole series of variables helped us to choose LCD video projectors. The new Panasonic PT-EX16KE series was used for the larger images, while the PT-VX500 series was used for detail. The projectors had the right luminosity, resolution and cost for the operation being carried out, in line with the budget set. The 13,000 ANSI Lumens projector was used for the first test, although we were aware that the range included a model with the same characteristics but greater luminosity, which we subsequently decided to use for the entire project. All of the executives participated in the demo, including all of the players involved in the project, from Paco Lanciano to representatives from Rome city council. And we realised that we had made the right choice of products for the operation during the testing phase itself." "Having chosen the devices to use, we moved on to the transportation phase, which was particularly delicate," explains Volpato. "Moving a significant quantity of sophisticated devices within a limited timeframe to an area of Rome that is closed to traffic and not accessible to articulated lorries was not an easy task. We are talking about delivering delicate machines including large and small video projectors, as well as all the related optics, in a place that requires special access permits. Consequently, we had to choose a suitable vehicle that was big enough to carry all of the devices while not being too big to access the archaeological site." "For this operation," continues Altobelli, "along with my colleague Francesco Antoniello, we set up a project which we called REMU (Regia Multimediale), which uses network cabling to enable us to manage audio, video and lights in remote equipment located in multiple separate positions. The idea was to create a sort of large video recorder that we could use to control everything with a few actions, from play to stop, including all of the typical functions required to manage a film. Consequently, we looked for a software application that was not tied to the hardware being used, and that we could use to simultaneously run 33 films, six audio channels and lighting. With regard to the choice of video projectors, it was finally decided to use 33 Panasonic machines: 6 PT-EX12KE video projectors, 6 PT-EX16KEs and 21 PT-VX500s"
"We were using powerful machines, Panasonic video projectors with high-brightness, high-resolution light beams, so we had to position them as correctly as possible and synchronise them to the millimetre. I had done this task many times before during my professional career, but I never had to worry about frame synchrony, as I had to for the Roman Forums. We worked on the synchronisation and recalibration of the images from every single machine extremely meticulously, including during the projection phase. To get it right, we had to repeatedly use the software to make sure everything was perfect, second after second, for 45 minutes of film. It was a little bit like being the conductor of an orchestra, responsible for 33 musicians during a concert at La Scala. For example, the show includes, among other things, a scene in which migrating birds fly from right to left over a distance of more than 300 meters. We succeeded in making this scene fluid, with no gaps or overlaps between the images from one projector to the next. Indeed, this was one of the fragments chosen as a reference source for synchronising the 33 Panasonic projectors. We needed to calibrate the system for this scene to ensure that it kept synchronous control of the images throughout the entire duration of the film. To do so, we used active and passive controls to ensure that a local server could control the time codes of the entire film and each individual projection both during the starting phase and throughout the entire run time. Consequently, all of the 33 projectors are continuously synchronised using a predetermined road map and the system is able to perform a realignment of any lag, even of just a few milliseconds. Furthermore, the response of the video projectors was excellent. Don't forget that we did not have screens like video terminals, but ancient walls that had somewhat irregular surfaces". 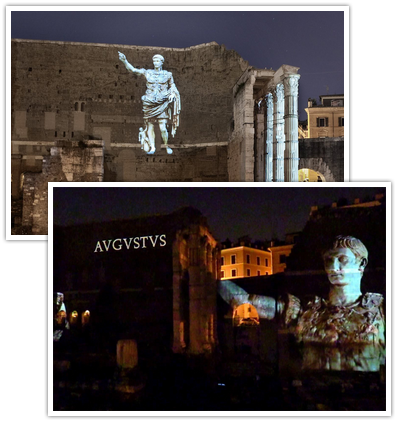 "When the installation was complete," concludes Luca Altobelli, "we ran the first projection in the presence of the Mayor of Rome and an international audience, including 18 ambassadors and more than 250 diplomats. From that day to this, everything has worked perfectly: three showings every night, each lasting 45 minutes, with an audience of 200 people each time. The installation has a three-year performance cycle".